Just a heads up for all of you who stepped up and pre-ordered TruStack Tire Dollies at the SEMA Show and afterwards. The factory has received its shipment of raw material and has begun molding the HDPE base units. We expect those to be completed by mid-week next week, and I intend to be there for quality control. A couple other small details will be confirmed while there such as the decorative stripe around the dolly and we are working on sourcing some lash straps so they can be purchased here if so desired. All in all, we appear to be right on track with what we communicated at the SEMA Show: Depending on Ocean Crossing times, we could have product in country in December with shipping to customers late December or first week of January. Thank you for pre-ordering this Brand New Tool! You will be the FIRST people to receive and begin saving time and money with this product. Just for fun we took some pictures and video of the TruStack Tire Dolly Mascot as it walked around the show looking for people to be eaten... er,.. to be frightened. It seemed especially enamored with a particular booth that featured a greenish truck, as well as its own booth, the TruStack Tire Dolly Booth. Oh. And the Global Media Award displayed at the end? It's not for the video. Trust me. This is an amateur video of my 4 year old Grandson controlling a whole stack of tires by himself using the superior steering characteristics of the TruStack Tire Dolly. He steers it around cones while looking pretty funny with his hat on backwards. Oh, well. He and his brother got milkshakes at In-n-Out, then I gave them back to their Mom on a sugar high! We had a great time at the SEMA Show. A common sight at the show is the use of a variety of methods of gaining attention. Dressed up chickens, freebies, incredibly beautiful displays of Automotive Machinery. And a T-Rex. First Customer! Thank you Andrei of All Star Tire in Long Beach California! Our SEMA Debut was FANTASTIC! So many saw the value in this product so quickly that we were busy all week showing it off. We even forgot to eat! Many pre-ordered right at the show to take advantage of our special debut pricing, but Andrei Karapetian was First, and he'll always be Number One with us. Thank you Andrei and All Star Tire of Long Beach, CA. It's Official! 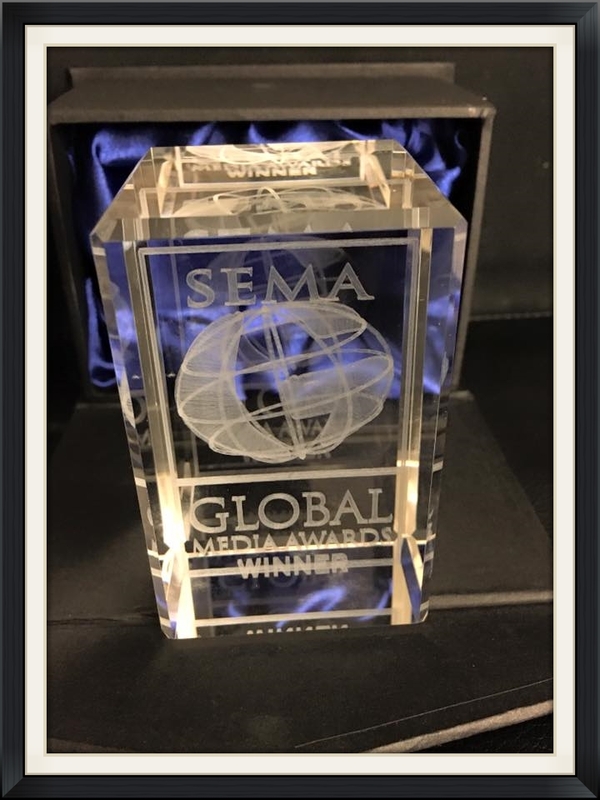 The TruStack Tire Dolly won a Global Media Award at SEMA! Wyatt is only 4 years old, and he pushed this load around cones, proving just how "EZ" it is to steer and guide loads with this platform. Stability and Security Test. Check. And another beautiful shot of the bottom. Very strong design. A view of the center anchor from the top along with the hand hole. 3+2 Caster Configuration. These are the 2 rigid casters that provide directional stability. For those of you who want to get in early on this project, we will begin pre-orders as soon as a container load is ordered which should be within the next week. We returned from the factory with hand carried units from the first batches out of the mold, and we are very happy with the results. We have some tests to carry out this week and are likely to make 3 or 4 minor modifications to the mold, but after that it is full speed ahead! We are testing the screws that hold the casters on, and we will test to see just how much abuse these things can take. We might not be able to break them because the are very strong. I might need to get help from my grandsons because they can break almost anything! The central core of the tool, machined and ready to go. Tooling is on schedule to be completed by the middle of this month. "First shots" to follow, then we will have the "real thing" in our hands and can begin final tests. Postcard Inviting SEMA Attendees to Booth #38221 for the big debut! Another drawing by Artist Reese Banke, this one illustrating how stable a TruStack Tire Display is when the tires are locked down to the dolly. Thank you to Artist Reese Banke for his ideas on how to convey the disadvantages of a standard Tire Clamp Dolly as compared to a TruStack Tire Dolly! Yikes! The design for the Dolly Face is nearly complete. You would think this would be easy, but there are several components to the process that are fairly important. Of course it needs to look cool, but it also needs to instruct the operator of the dolly intuitively. To do that, the face incorporates three concentric circles, two solid, one dashed. in addition, the two solid circles are thick, so they can represent an additional two diameters. these act as a visual reference point for the individual who is attempting to center that first tire onto the dolly. As every tire professional knows, if the first one isn't straight, the rest of them can only get worse! In addition, the dolly face includes a very large arrow, intended to point in the direction of travel. The reason this is important is that the caster design allows for very precise steering or guidance using 2 rigid parallel casters, plus 3 swivel casters. Inferior dollies use only 4 casters instead of 5, they all swivel, making momentum difficult to control, or they have 2 rigid, 2 swivel, which also makes the load difficult to control. Since this dolly is round, we incorporated that large arrow to point you in the right direction. Last, we wanted to include the website, safety info, and of course, the logo. One more step complete as we near the end of the beginning. Don’t get me wrong, I love Tire Clamp-Carts... so fast and easy to move large quantities of barrel-stacked tires. But every time you need to be gentle, it’s impossible. It’s especially irritating to move displays on a daily basis. Maybe not so bad at night when you are closing the store and moving displays in, because who cares how straight that barrel stack looks while hanging out overnight in the dark? It’s in the morning while setting them out that a clamp cart does it’s damage, because you simply cannot tilt a tire stack back 45 degrees and then set it back upright without the stack shifting or bouncing out of position when it is finally placed. Now if you and your crew are professional, and who among us doesn’t desire that, you will obviously want to take the extra time needed to straighten the stack up. You will spend time lining up the tire labels, repositioning your pricing information, and setting that top tire up in a way that is uniform and consistent with the way your other displays are set up. And of course, you must do all this at a time when you are also making coffee for customers, preparing reports and plans for the day, waiting for a full crew to arrive, and dealing with early-bird customers. Wouldn't it be better to set those barrel-stack displays permanently on a TruStack Tire Dolly? Build the display once. Build it straight, line up the labels, add marketing signs, set the top tire vertical and at just the right angle, and cinch it all to the dolly using the built in anchor system. Now you and your crew can simply roll the display out every morning, and roll it back in every night, and it will keep that professional look right up to the minute you sell them. Yes I finally did it. You can follow Chariot Concepts and TruStack Tire Dolly on Twitter @Chariot4Tires. We'll try to be interesting. Really.